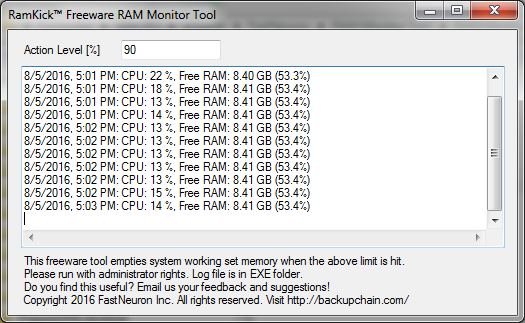 RAMKick™ is a new freeware tool we have that empties system working set memory automatically. It empties RAM used by Windows similar to RamMap but does so automatically and based on a threshold. On some Windows Server versions it is observed that under heavy load, the metafile memory is never freed and grows to the point where almost no physical RAM is available. This appears to be an issue with how caching was implemented in Windows and when very large volumes (in terms of number of files and folders) are attached to the server. RAMKick™ is a RamMap alternative. RAMKick is like an automatic RamMap, i.e. RamMap automation. Use RAMKick to clear large metafiles and there is no need for a command line or batch script since RAMKick runs automatically on a schedule.